"Now YOU Can Build a Shed Even If You're Not a Carpenter"
Where to find free shed plans is probably one of the most popular requests we receive from our visitors. 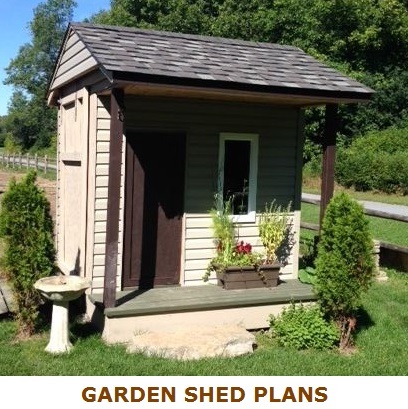 Typically, inquiries we get are for free tool and utility shed plans, garden sheds, a multipurpose shed, tool sheds, gable plans, barn styles, saltbox storage shed plans, gable shed blue prints, porch shed drawings, hobby sheds, bike and boat sheds, and many more. What follows is a broad list of links to various shed building plans at no charge to you. You may notice that some of the plans also contain specific "how to" instructions and a bill of materials list (BOM) required for building a shed properly. Take your time going through these freebie plans to build a shed, as there could be a hidden gem that's just right for you and your needs. Below is the directory of free shed blueprints that we put together for your use. If you are in need of professional computer-aided shed drawings that are customized to your requirements, please feel free to send us your details, sketches and "scans" of your information by contacting us here. As soon as we review your info, we will contact you with a shed designs estimate. Probably the best free shed plan we've come across! This free 24 page PDF file of shed designs contains everything you need to build your shed. Highly recommended. 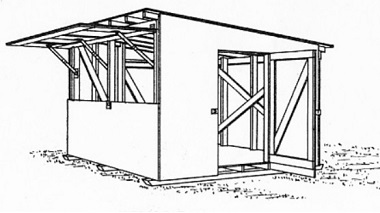 The University of Tennessee produced these four styles of storage shed drawings. The PDF file includes detailed plans, elevations and sections of 8'X10' and 10'X12' sheds, as well as, 12'X16' and 12'X10' sheds with porches. 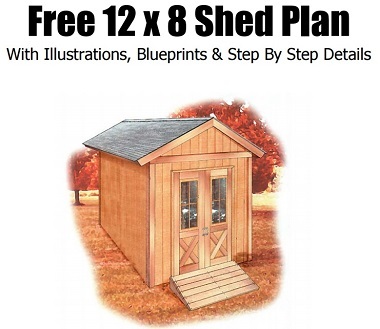 Free 12'X12' shed plan with pop-up opening. Includes front framing elevation, end framing, corner post details, plan and perspective. All on one sheet. Firewood Shed Plans - Simple sketches explaining how to put together a fire wood shelter. Two-in-One Shed - A free storage shed plans by Popular Mechanics. The Ten Buck Wood Shed - Quick, easy and cheap shed building instructions. Colonial Shed by Popular Mechanics - A free detailed set of instructions to build a 10'X16' storage shed. 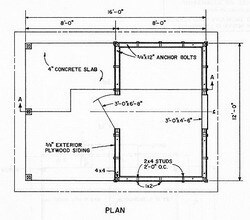 10 Foot by 8 Foot Shed - This extensive set of printable plans includes the elevations, cross sections, floor plan, concrete pad, skid foundation, wall details, rafter placement, specifications, a materials list and even templates..
MyStorageShed - A blog about how to build a storage shed. Build a Garbage Shed - Simple steps with photos, a BOM list and even a list of the tools you'll need! Free Shed Plans - A 2 page utility shed set of plans containing specific building info, free of charge. Rona's Free Plans for Shed - It's in this building center's best interest to give you a set of drawings and how-to info, in order to build this shed with their materials. Black and Decker's Storage Building Plan - A well put together set of instructions, pictures, drawings and more, for your shed. Timber Frame Wood Shed - Follow along the detailed directions on how to build an outdoor storage shed. There are more shed resources, such as shed kits, playhouse plans and tool shed drawings to be had over at our free garden shed building plans. Did you build your own shed? Please share your experience! Send this page to a friend and let them know about these free shed plans that may be useful to them as well.